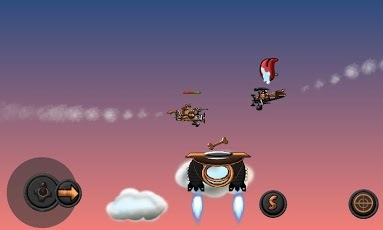 Daredogs takes players into the air for some true dogfights, and the result is both cute and very entertaining. Developer Bugbyte Productions gives players a game that’s not only fun and challenging, but also helps out four legged friends in the process. The developer is currently donating 10-percent of all profits to select animal shelters and foundations, and they pledge to up that number to 20-percent if they hit a goal of 5 million downloads. A fun game with a philanthropic twist is hard to turn down, so let’s take a look at what makes this game worth your time and money. 10k Gold – $0.99 – Removes ads and players receive 10k of gold with 10% of profit going to charity. 30k Gold – $1.99 – Removes ads and players receive 30k of gold with 10% of profit going to charity. 80k Gold – $4.99 – Removes ads and players receive 80k of gold with 10% of profit going to charity. Most of the initially available upgrades cost between 1000 and 3000 gold, so you can see how even a 10k Gold purchase can make the game considerably easier. Of course, if you prefer to earn your gold the old fashioned way you can easily obtain plenty of gold just by participating in events. The plot to the game is fairly simply. You play a dog pilot named Bravo, the son of a legendary Daredogs pilot with a son who looked up to his father as a hero. Unfortunately, Bravo’s father is shot down in a suspicious act during a tournament by another pilot named Rocco. 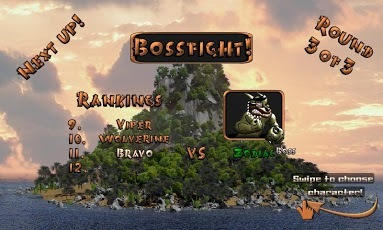 Bravo has no choice but to enter the tournament himself and avenge his father and win back the trophy from Rocco. It’s nothing particularly unique, revenge plots are a dima-a-dozen, but it fits in well with the gameplay and provides a good backdrop for the tournament. 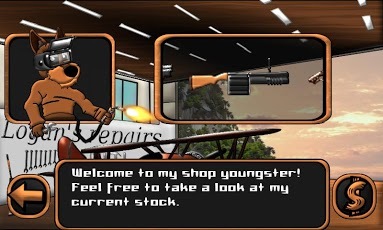 Players can choose from four unique characters to play as throughout the tournament in Daredogs, helping to keep things interesting and mix things up if it starts to feel stale. The gameplay is simple yet addicting. 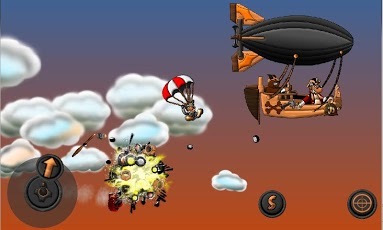 Players control the planes using a joystick on the bottom left of the screen, and fire their weapons by tapping another button on the right. The planes are agile and easily flip and reverse direction on a whim. Your enemies will vary speed and direction quite often, and shooting a straight shot can get very difficult. There are four game types to play; Race, Dog Fight, Capture the Bone, Pirate Heist and of course there are boss battles mixed in throughout Daredogs. The weapons and armor of all craft can be upgraded through the shop, and there are tons of unique and zany weapons to equip your pilots with to better destroy your enemies. Every fight you play in, from the very first to the last, is unique and challenging. At no point will you feel like you’re just going through the motions, especially since each enemy has a unique personality that really adds flair to the experience. Daredogs is a great game that a player can easily pick up and understand right off-the-bat, and most fights can take place over just a few minutes, making it a great game to play while on the bus or while waiting in line. The added bonus of having part of your purchase go toward animal relief organizations makes this game particularly worth the time and the money. Don’t be concerned that Daredogs relies too heavily on charity as a cruch, it’s a great game regardless and holds up very well on its own. Daredogsis available now for Android 2.2 and up, and is rated Low Maturity. A small expedite fee was paid by the developer to speed up the publication of this Android game review.